First, choose a good fabric. Many kimonos in stores are made from sheer, floaty fabrics because they're light and hang nicely, which is what this look is about. They're often polyester, though, and not very breathable. I wanted something I could wear comfortably in the summer heat so I made this from a lightweight jersey knit. The most important thing is choosing a fabric that drapes well, so see what you like at the fabric store (rayon, jersey and other apparel fabrics are a good place to start). I got this one at Joann Fabrics. Next, you need to cut the fabric to size. This will vary depending on how big you want the kimono. I went with a piece measuring 45" wide and 60" long. 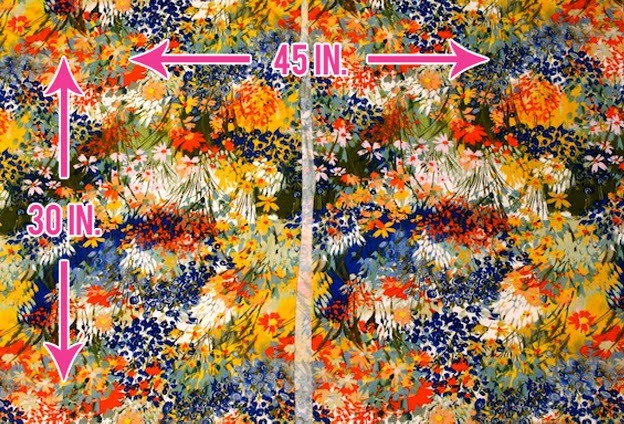 If you want a longer/shorter kimono, adjust the 60" side; if you want a wider/narrower one, adjust the 45" side. Decide what size you want and cut away! Once you're happy with the size, lay down your fabric, right side up, and fold it from top to bottom. In my case, this gives me a piece that is 45" wide and 30" long. Now, fold it in half again from left to right. Mine is now 22.5" wide and 30" long. Put a pin in the fabric at the top left corner. This is the only corner with no open edge. Next, we want to cut ONE layer of the fabric. At the bottom left corner (opposite the pin) cut straight along the edge until you reach the pin. 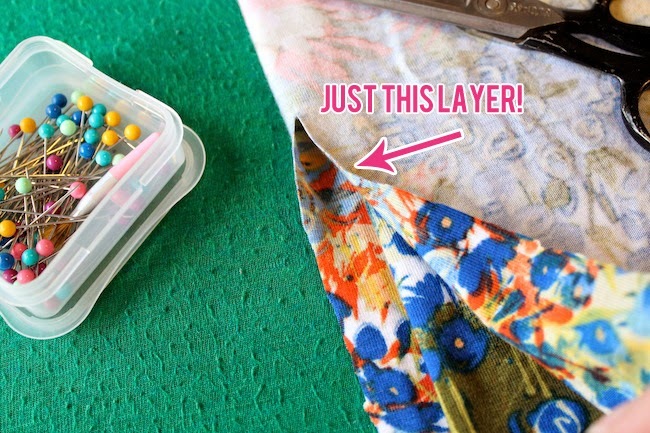 You only want to cut the top layer of fabric here. This cut will become the opening to your kimono. I'm cutting TOWARD the pin we put in. Did I stress this enough? Remove the pin and rearrange the fabric so that you have a doubled over rectangle with a slit down the center front, like below (yours should be inside out). Measure about 10" down the left side of your fabric, starting at the top corner. Place a pin at that point and continue to pin down the side. Repeat on the right side of the fabric. That 10" area will become your arm hole, so try it on while pinned and adjust as needed. Sew straight down each side of the fabric along where you pinned. 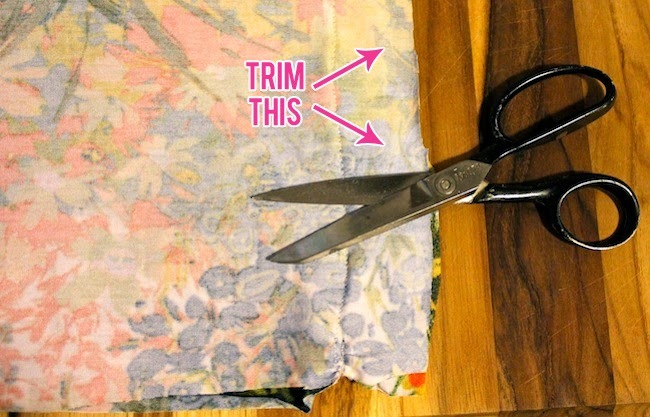 Trim any excess fabric to the side of the stitches. Flip the whole thing right side out. Now, this is where you'd normally finish the hem of your fabric, but because I used jersey knit, the hems will roll up if you give them a slight tug. Yet another reason I strongly suggest a jersey knit! Rolled hem = less work and more kimono wearing time! This is basically a rectangle with some holes on the side. YOU CAN DO THIS!!! This is one of the quickest and easiest sewing projects I've ever taken on. If you feel even kind of comfortable with your sewing skills (or, honestly, even if you don't) you could whip this up in an hour. I plan to make several thousand for the summer. Okay, maybe more like five. You can belt it too! Do you like kimonos for summer? What other colors and patterns do you think I should make? Which Golden Girl has the best style? You're so talented and creative! You make this look so easy but I'm a mess with a sewing machine. I really love the fabric you used too - it's so colorful and pretty! I LOVE your "Golden Girls Complex" explanation for gravitating toward flowing clothes. HAH! I'm like you, Golden Girls Complex! The kimono is awesome!! I'm not one for sewing but I think I could 100% manage with your directions. Thank you for sharing this DIY!! I made a couple last year, they are so easy to make! I love this one, the print is so pretty and colourful! 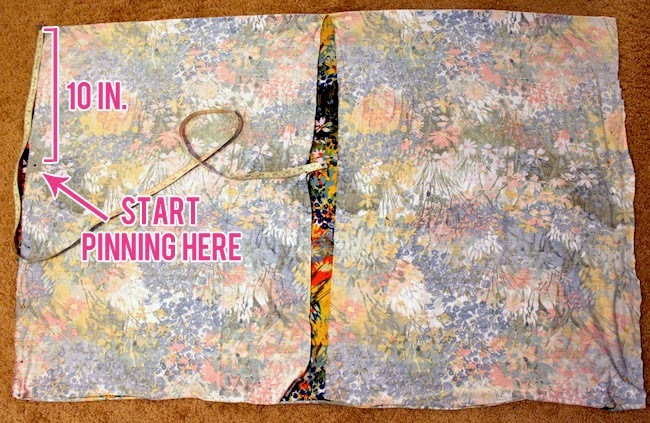 This is such a cool project, it looks really easy to make it and I really like the fabric you chose! That's such a pretty print, and looks great! What a fun DIY project! And that print is just too pretty! 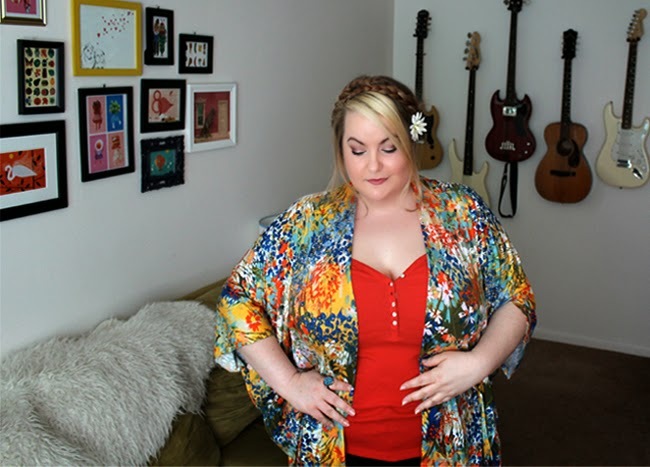 Love your cute diy kimono. I wish I could sew. I love kimonos for the summer. Blanche had the best style! I love how this turned out, the print is so cute! What a cute DIY! It turned out beautifully! !